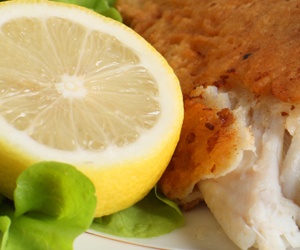 We’re a family run mobile Fish & Chips service in Kent and we make seriously good Fish & Chips! We believe that quality is everything, that’s why we have invested many thousands of pounds in equipping our purpose built fish and chip van with quality machinery and of course, as you would expect, we only use the best suppliers. Our fish, where possible, is sourced from sustainable stocks and is line caught. Each fish fillet can be traced back by our supplier to the individual trawlers in the fleet, this attention to detail is important in ensuring the ongoing quality of the product. Of equal importance are the chips! No horrible frozen chips or pencil thin fries at The Village Chippy, we use potatoes grown in Kent by the Counties Premier supplier of chipping potatoes to give a fresh crisp chunky chip every time, taste one and you’ll be hooked for life! We honestly believe that we offer the best mobile fish and chips anywhere . Try us – you won’t be disappointed.